Rhetorical scholarship has for decades relied solely on culture to explain persuasive behavior. While this focus allows for deep explorations of historical circumstance, it neglects the powerful effects of biology on rhetorical behavior – how our bodies and brains help shape and constrain rhetorical acts. Not only is the cultural model incomplete, but it tacitly endorses the fallacy of human exceptionalism. By introducing evolutionary biology into the study of rhetoric, this book serves as a model of a biocultural paradigm. Being mindful of biological and cultural influences allows for a deeper view of rhetoric, one that is aware of the ubiquity of persuasive behavior in nature. Human and nonhuman animals, and even some plants, persuade to survive - to live, love, and cooperate. That this broad spectrum of rhetorical behavior exists in the animal world demonstrates how much we can learn from evolutionary biology. 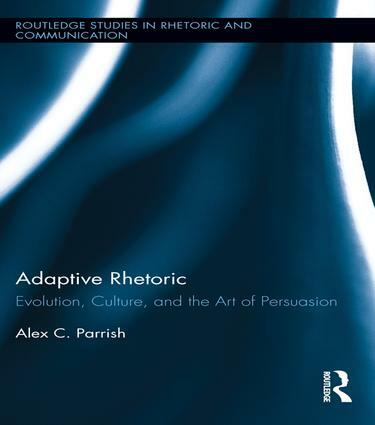 By incorporating scholarship on animal signaling into the study of rhetoric, the author explores how communication has evolved, and how numerous different species of animals employ similar persuasive tactics in order to overcome similar problems. This cross-species study of rhetoric allows us to trace the origins of our own persuasive behaviors, providing us with a deeper history of rhetoric that transcends the written and the televised, and reveals the artifacts of our communicative past. "In this well-researched, cross-species study, Parrish employs a biocultural paradigm when tracing the origins of rhetoric. He reveals the artifacts of humans' communicative past via the lens of animal signaling, uncovering how animals exercise persuasive tactics in order to overcome difficulties that are similar to human problems … No other book examines rhetoric from this perspective in such a thorough way." "Parrish's book is important. It brings together a wide range of findings in the sciences and humanities; it endorses a much broader conception of communication that extends beyond animals, akin to ongoing inquiries in biosemiotics; and, most centrally, it expands rhetoric beyond the confines of the human." Alex C. Parrish is Assistant Professor of Writing, Rhetoric, and Technical Communication at James Madison University, USA. This series is our home for cutting-edge scholarly studies and edited collections in the fields of rhetoric and writing studies. Interdisciplinary in approaches, these titles are characterized by dynamic interventions into established subjects and innovative studies on emerging topics.